A classical pianist and music professor. LA is a special place to my family, because my older brother, Angelo, was born here. Next in line, Angelin, Angelina, and Angel. Anybody know what a “hoosier” is? It originated when there was a knock on the door and people in Indiana would say “who’s there? (hoos-ierrrr? )” She’s trying to connect classical music to a new audience, she’s a big fan of the Disklavier piano. She did a performance where they hooked up the MIDI output to have live graphics triggered by her hitting the keys performing a Liszt piece. She’s now doing a Bach piece that demonstrates this. 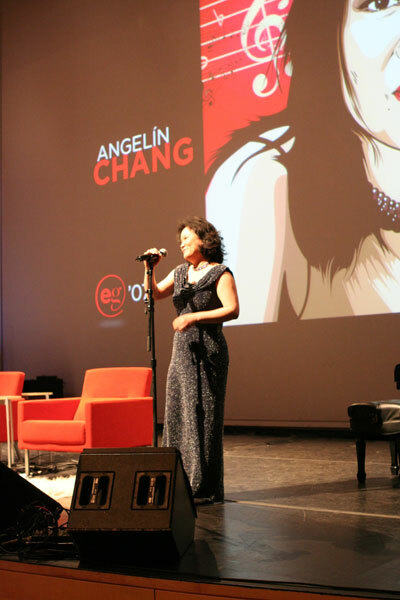 You can see her website and buy her CD at angelinchang.com. This entry was written by Matt, posted on December 3, 2007 at 6:03 pm, filed under Session and tagged angelin chang, classical music, eg2007. Bookmark the permalink. Follow any comments here with the RSS feed for this post. Post a comment or leave a trackback: Trackback URL.